Enjoy dining at 15 selected restaurants. New family accommodation, bungalows snugly embraced by pine groves, pastel-coloured villas in the colours of the flaming Ionian sunsets, royal pavilions and imperial palazzos hovering over the Ionian Sea. 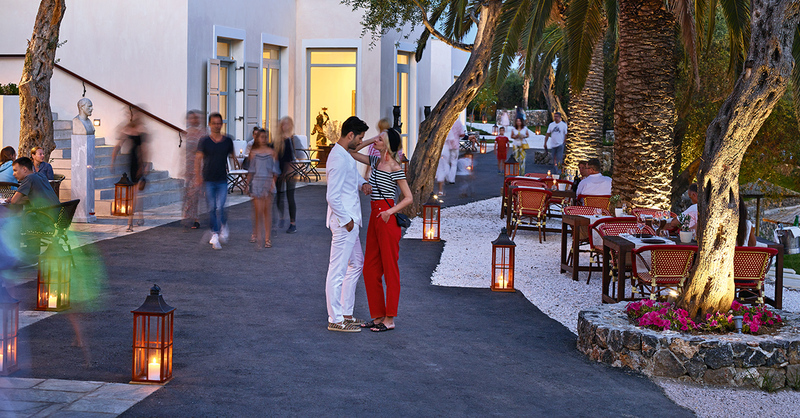 A world of seaside olive trees, marble & palms, beach coves, fine dining & a lovely promenade. Embark on a culinary adventure through the private Corfu Kommeno peninsula and enjoy dining at 15 selected restaurants. Stroll down the lovely promenade with a wide range of exuberant restaurants, services and entertainment. Designed respecting the island’s unique architecture in a minimal and utterly stylish setting, these beautifully refreshed country rooms among seafront gardens are dominated by white; the colour which shines and affirms everything. A brand-new dining experience at Corfu Imperial delivers fantastic food, magical atmosphere and views, and superlative service. The brand new grand pool among the Italianate gardens along with a great choice of by the pool dining will be guests’ favorite retreat. A brand new exclusive collection of 15 restaurants and bars including the all new and truly Mediterranean promenade and piazza area for refined or casual dining experiences. New “Il Boschetto” family accommodation at Corfu Imperial’s colourful established gardens. Individual buffet stations that display a bountiful Mediterranean spread at the entrance of the space. Scheduled, short routes will transport guests to the station of their choice, giving them the chance to enjoy the sea breeze and magnificent views of the peninsula. The 2 storey Elixir Spa, features an indoor pool and facilities fully equipped for head to toe pampering, from aromatherapy massages to signature Elixir Spa treatments. The Grecoland Club was created entirely with kids in mind. Brightly coloured benches and tables, costumes, crafts, activities and competitions create a magical holiday experience for children aged 4-12 years. Chef Thanos Feskos joins Aristos restaurant and will guide you to his culinary world forged through his diverse experience and acquired knowledge working in Greece and abroad. A beautiful collection of 15 seafront restaurants with spacious verandas overlooking the Ionian Sea for you to embark on a journey of taste. A large selection of on-site facilities enhanced by additional off-site options, from watersports and horse riding, to golfing and much more! Escape into the lavish settings of Corfu Imperial’s exclusive villas - all strikingly elegant and enhanced with new pools and a private entrance area. 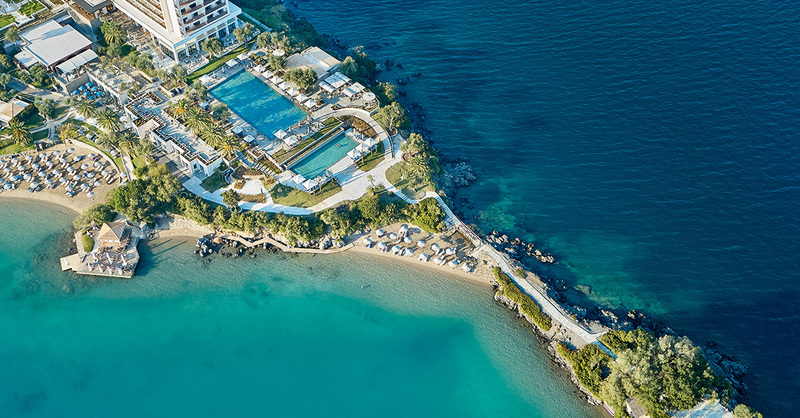 New Grecoland club with creative activities, child-friendly beach, water games and much more! The Kids Summer Camp is a hit as it is full of great activities. Private coves with 3 sandy beaches, new grand pool and 24 private pools for you to relax and enjoy the beauty of the sea, sky and fairytale Corfu landscape. The new 2 storey Elixir Spa, features an indoor pool and facilities fully equipped for head to toe pampering, from aromatherapy massages to signature Elixir Spa treatments. 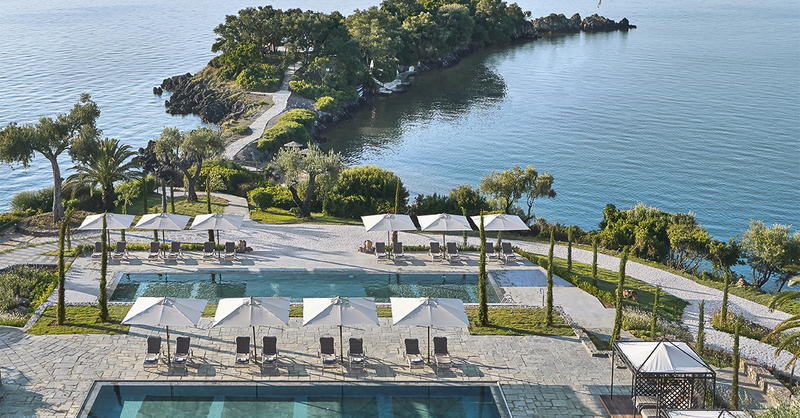 Grecotel enhances your Corfiot experience with 3 dazzling resorts designed to make your holiday fantasy real. From fine dining and signature spa treatments to an abundance of experiences for all! Luxury sea or land transfer between the resorts available.